Meals on Wheels (MOW) provide a nourishing meal at a reasonable cost. Hot MOW are delivered in Kemptville; and, frozen Meals on Wheels are delivered in Kemptville and throughout the Municipality of North Grenville. This service is available Monday to Friday, except on holidays. 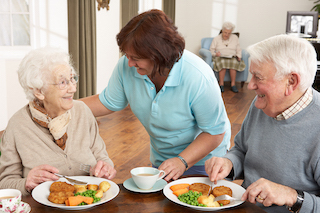 Meals on Wheels delivery provides a security check and social contact for people. Choosing Meals on Wheels is also a way for clients to maintain independence by ensuring that they have nutritious meals available. Meals on Wheels are available to seniors and adults with physical disabilities. How to order a meal? Phone the Centre between 8:30 a.m. and 4:00 p.m. at 613-258-3203, or in person at 215 Sanders Street, Suite 101 in Kemptville. Every attempt will be made to fill a request for meal delivery on the following week day. Frozen MOW can be delivered, or picked up if this is more convenient. How to cancel a meal? Cancellation of meals must be telephoned to the Centre before 10:00 a.m. on the day the meal is not required. Orders can consist of a combination of entrées, soups and desserts. There is an extensive menu to choose from. We are able to accommodate special meal needs including renal, celiac, minced and puréed. Gift certificates are available throughout the year, and can be made out for any denomination. The Diners' Club is a held weekly at the Centre. The hot meal is served at noon. Reservations must be made before 12:00 p.m. Tuesday. This is a great opportunity for clients to meet old friends and make new ones. Guest speakers are scheduled throughout the year. Transportation, both local and long distance, is provided by volunteer drivers. Medical requests receive top priority. Drives of a social nature are provided when possible. Seniors and adults with physical disabilities. How to arrange escorted transportation? Request for drivers must be made through the office, Monday to Friday between 8:30 a.m. and 4:00 p.m. by calling 613-258-3203, or in person. When the request is received, we will contact one of our volunteer drivers, who in turn, will confirm the drive with you. KDHSI carries insurance coverage on all of our volunteer drivers. We ask that requests are made at least two working days in advance to allow for staff to arrange for the transportation. However, we do recognize that last minute medical appointments may be necessary and we will try to fill them. Fees are based on a flat rate according to destination. Parking fees are the responsibility of the client. A transportation fee schedule is available at the Centre. The friendly visiting program is designed to provide one-to-one friendship and support for seniors and adults with physical disabilities who are not as active in the community. A regular weekly visit from a volunteer brings companionship, an opportunity for social activities, and increased connection with the community. What to do on a visit? These ideas are only a few of the many things you might do on a visit. The range of activities is only limited by the imagination. Euchre; Paint & T'ookies; Singing Seniors; Skip-Bo; Cribbage. Exercise classes are held at the Centre, providing stretching, range of motion movements to help increase or maintain flexibility and balance. Daily telephone calls, by a volunteer or staff person, are made as a quick check with the client. Follow-ups are made as required. Proper foot care is very important in all stages of life, but especially in later years. Painful foot problems may prevent someone from leading a fully active life. The foot care is provided by a specially trained registered nurse. What the Foot Clinic offers? Foot care includes trimming of nails, treatment of calluses, corns and ingrown toenails. The Nurse will notice any changes that need further attention, which is very important for diabetics. When is the Foot Clinic available? The Foot Clinic is held weekly by appointment. Clients must register beforehand by phoning the Centre at 613-258-3203. Help with general housework such as vacuuming, dusting, cleaning batherooms and kitchens and laundry. This is a "referral" service only. Available for minor repairs, painting, yard work etc. This is a "referral" service only. Available in March and April. This service is provided by volunteers and is available to modest income seniors and adults with physical disabilities. If KDHSI staff are unable to assist you, they will refer you to the appropriate agency.